I recently listened to a webinar by Ocean and John Robbins who are pioneers in the “Food Revolution”, I jotted down some notes on the program and included a great recipe they provided. The tips below were helpful for me and hope they are for you too! I also included a few of my own tips. Remember your journey, whether it’s to a more healthful diet, more compassionate lifestyle or more spiritual healing and expansion is not about perfection, it’s all about progress. Stay positive, be happy and congratulate yourself for all the great things you are doing for your body, your mind, the animals and the planet! 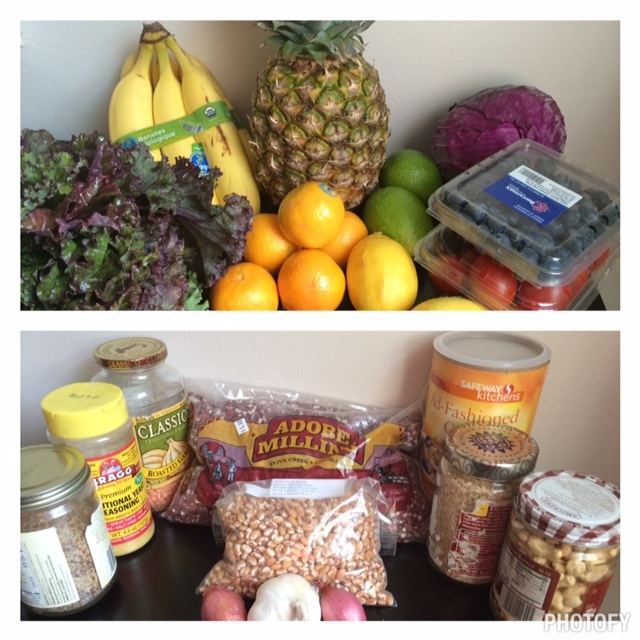 The picture above is an example of some of the ingredients I keep in my kitchen and will eat in a week. A variety of colorful fruits and veggies along with whole grains, beans and nuts. Please note, I store a lot of my grains and beans in glass containers that I have washed throughly and am reusing. These containers will help keep things fresh, in view and accessible and are a great way to reuse, reduce and recycle. When you surround yourself with healthy foods that are easily accessible and organized it’s much easier to stay on track! What are some choices we can make each day to help us healthier, save time & money? Three pretty easy steps: Plan, prepare & play! Dedicate an hour each week to meal planning & reviewing recipes. This can often be done on Sundays and is a good time to review your calendar (we will discuss this in greater detail in future posts). Don’t wait until dinnertime to decide what to have for dinner. Engage your whole family, if you have kids have them help with the shopping list (and the shopping). Make a running shopping list for staples. When you shop, divide shopping list into; bulk, produce, refrigerated section. Supplement with home-grown, get your kids and entire family involved in this too. Plant your own beautiful garden with a variety of produce that you enjoy! Be sure you have all the right tools. Invest in a blender and food processor, pressure cooker, rice cooker, etc. These can often be found on Craigslist used for a bit less expensive if cost is a concern. Other helpful tools include a steamer basket, sharp knives, a variety of pans, cutting boards. Avoid non-stick (some non-stick surfaces can emit toxic fumes), ceramic works well. Buy in Bulk; Grains, seeds, legumes, nuts, dried fruit, and nutritional yeast are just some of the many foods that are often available in bulk bins. When you shop in bulk, you can stock your pantry, refrigerator and freezer with foods that you’ll then always have on hand when you need them. Having your pantry well supplied with the staples you most frequently use is one of the surest ways to help you swiftly and happily put healthy meals on the table. 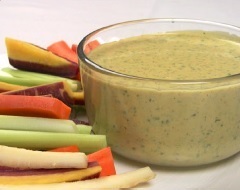 Foundations of your meals can include; beans, whole grains, homemade dressings, potatoes, squashes. Make base foods ahead (on the weekend is a good time) and prechop veggies. Wash and chop veggies you will use and store them to be tossed into salads, soups, wraps. Freshest is always best whatever you can do to increase your veggie intake is always good. Store lettuce in a paper towel (can be wetted, this will keep lettuce and other greens fresher for longer). Veggies that work well to wash and cut in advance include onions, cabbage, green beans, carrots, kale and broccoli. Softer or easier to spoil veggies and herbs like bell peppers, lettuce, tomatoes, parsley and cilantro are best left until the time when you’re preparing your recipe. Place each item separately into a container with a lid, unless you know you will want to cook them together and want to store them in one container. Once or twice a week, make a sauce, dressing, or condiment you can then use on salads, in combinations of the legume and grain you’ve cooked, and on steamed or stir-fried veggies. Freeze broths, purees, for quick soups and as a base, also freeze fresh herbs, etc. Stock your pantry with canned beans and some soups. Sometimes canned products can be high in sodium, just keep this as a go-to, they are still healthier than processed foods. A great tip….. rinse beans to remove salts and gas causing enzymes. Pre-prep your smoothie ingredients as well! Wash, dry and tear leafy greens and combine with berries or other ingredients in air-tight containers or plastic baggies. This makes the morning easier when you can just dump the ingredients into the blender. Understand more about grains and beans that are easy to cook; quinoa, buckwheat, couscous. Boil some whole grains or beans on the weekend, and keep in the fridge. Freeze extra portions in portion-sized bags and you can make a meal for one easily. Be organized; It really does help to keep your kitchen well-organized. That way, when you’re ready to prepare a meal, you can more easily gather the ingredients and equipment you’ll need. If your fridge and pantry are well organized, you can see at a glance what you have available. Create a positive and creative kitchen environment. Make it fun! At first using recipes is the easiest way to have time-tested food that turns out well most of the time. After some time you will be able to let your creativity take over with leftovers, have fun with it and make a wide variety of delicious meals from the ingredients you have purchased weekly!! This delicious dressing goes great on massaged kale, orange peppers, avocado, lettuce, arugula, red cabbage, fennel, and white beans, and any salad would be enhanced by it. Since this is so tasty, you might want to double the recipe and keep more in the refrigerator. You can also put it over steamed veggies, baked potatoes, or brown rice and vegetables, or you can even marinate tofu in it. Soak the date(s) in the water for 15-30 minutes, using warm water if you are in a hurry. Combine the rest of the ingredients in a bowl, except for the herbs. Put the dates and the water in a blender along with the garlic and lemon/lime juice and blend to chop the date and the garlic. Add the bowl of the other ingredients and blend. Add the herbs and blend briefly to chop finely and incorporate. Add more water to desired consistency, and blend for a few seconds. Serve, or refrigerate for up to one week. This entry was tagged diet, health, healthy eating, healthy kitchen, healthy recipes, Plant based, vegan, vegan recipes. Bookmark the permalink. ← Compassionate Closet- Where to buy your Holiday gifts! !